We’re just 2 weeks away from the official beginning of summer! Summer is my least favorite season. I know I am the odd duck here with that opinion. I hate the heat, although being here in Maine; we have one of the better summer climates. We have very few days that go into the 90’s. The summer temps stay in the 80’s in the days and go down into the mid to upper 50’s at night. Compared to an awful lot of places, that probably seems like heaven. For me heaven is in the mid 70’s with the nights in the 40’s. 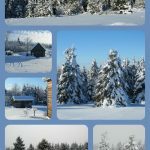 Here in the North Maine Woods those temps happen in spring and in fall. I hate the mugginess of summer, which is always oppressing for me. I’m sure a lot of it has to do with my asthma. I do like the flowers, and gardening of summer with all the colors that brings but Spring remains #2 on my season “Hit Parade” with Autumn as #1. Temperature of course has a lot to do with it but so does color. 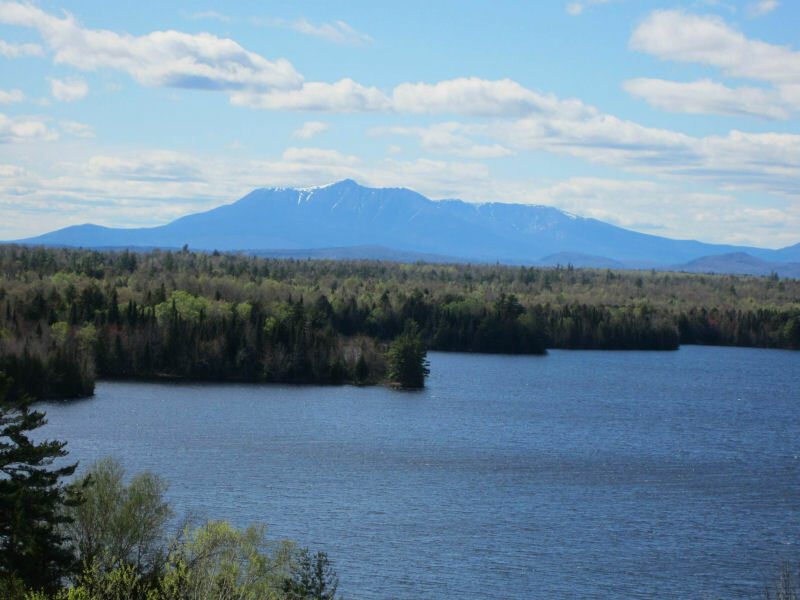 This stunning view of Mount Katahdin was taken from the "Scenic View" on I-95 just north of Millinocket , Maine looking west across Salmon Stream Lake. The artist in me loves the way Nature puts together color schemes. The vibrancy of New England autumns and the bold hues of a sunset can take your breath away. And the stark contrasts of winter along with the jewel-like glistening of the frozen landscape are so dramatic. But the subtleties of the spring color scheme are often over looked. Like the pastels of an early dawn, they are tender and new, soft and fresh. The greens are brighter and lighter than the summer greens, and there are pinks and muted reds from the flowering shrubs and tree buds that make the most beautiful and tender color scheme. 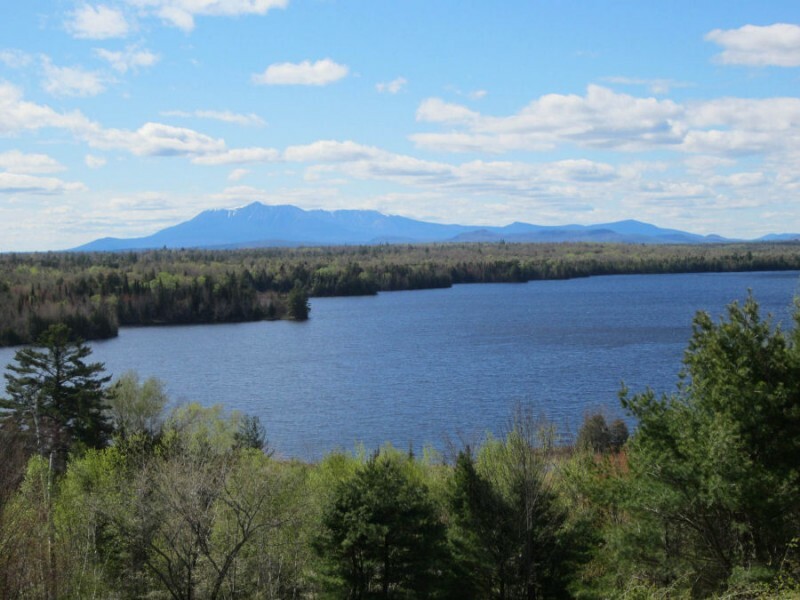 A couple of weeks ago, on the day before my birthday, I was coming home from an event at church and I stopped at a scenic turnout on I-95 just north of the Millinocket exit. The view is of Mount Katahdin and the other peaks in Baxter State Park as seen in the distance as you look across Salmon Stream Lake. It was a glorious day. Bright sunshine lighted the entire landscape. The sky was a vivid blue with pristinely white cumulous clouds drifting across. 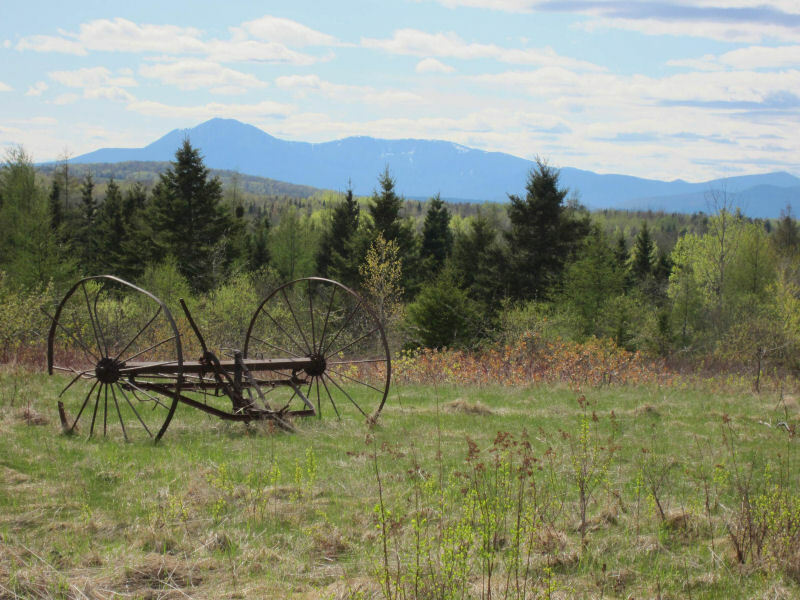 There was still sparkling white snow on the peak of Katahdin and the mountain itself was a vivid blue through the atmospheric haze. 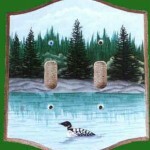 The lake reflected the azure sky and along its edges the reflection changed to a contrasting dark spruce and pine green. 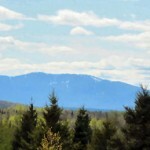 Between the lake and the mountain the forest was a patchwork of apple and mint greens, dark forest green and subtle pinks, and deep burgundies show the glorious colors of the spring North Maine Woods. The soft gentle colors of the landscape and the warmth of the spring sun made you feel oh-so lazy. If it hadn’t been for the ever present and always aggravating nipping black flies, I could have sat at the picnic table overlooking the scene for hours. It was just so visually soothing. The scenic view provides an expansive view of the entire Baxter State Park as viewed across Salmon Stream Lake just north of Millinocket, Maine.